The Orbitsound One has its own built-in subwoofer | What Hi-Fi? Orbitsound's new P70 sound system promises to take care of all your audio needs, whether it's TV, Bluetooth or hi-fi listening. 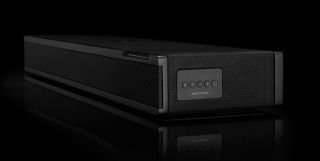 The Orbitsound One (also known as the P70) might look like a soundbar, but Orbitsound claims it's much more than that. For a start, it features airSound technology, which allows multiple orientations without compromising on sound quality. The proprietary technology works by firing sound out of the front of the unit, with side speakers adding spacial elements. This widens the 'sweet spot' you get with most speakers, giving everyone in the room the same listening experience. In our tests, we've found airSound to be pretty capable, with Orbitsound's products earning three- or four-star reviews. The Orbitsound One (P70) is the company's first one-box product with a built-in subwoofer. It says it's the first of a new generation in this line, so expect more on the way. As well as adding some oomph to your TV sound, the Orbitsound One (P70) also has Bluetooth for streaming audio from your phone, and hi-fi connections for making it a part of your system. It can be wall- or surface-mounted, or placed on a shelf, and so should suit whatever set-up you have. It's also pretty compact, measuring 70 x 17 x 7.5cm. The One has the ability to learn your TV remote control, and intelligently shuts down elements when not in use, minimising power consumption. When the audio starts playing again, it auto resumes. We're hoping to get a demo at the Bristol Hi-Fi Show today, so stay tuned. The One costs £300 and is available to pre-order now.